I want to Make Soap! Once desired consistency is achieved, the soap can be coloured, scented or any other optional ingredients added and then poured into molds. After 24 - 48 hours the soap is released from the mold(s), sliced and stacked and allowed to "cure" or dry hard for a minimum of 3 weeks to 6 weeks depending on formula. The hardest part for any new soap maker is the curing process (you have to wait!). This curing process allows the lye to neutralize and continue saponification. 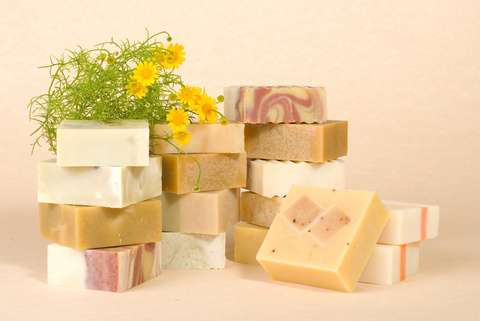 Using soap before its time may result in caustic soap, which may irritate the skin or cause soap to be soft and mushy. Hot process - this is the cold process method taken to the next level. Takes a bit more time. Once your soap has traced - continue to cook over low heat for an hour or more. This neutralizes the lye so that scenting your soap is not such a challenge or wasteful of your essential oils. Glycerine soap from Scratch Taking the hot process method to the next level with more time and safety precautions in place. Recipes will call for adding glycerine, alcohol, sugar, etc.